St Pirans Day today. This is the day that Cornish celebrate their patron saint St Piran. 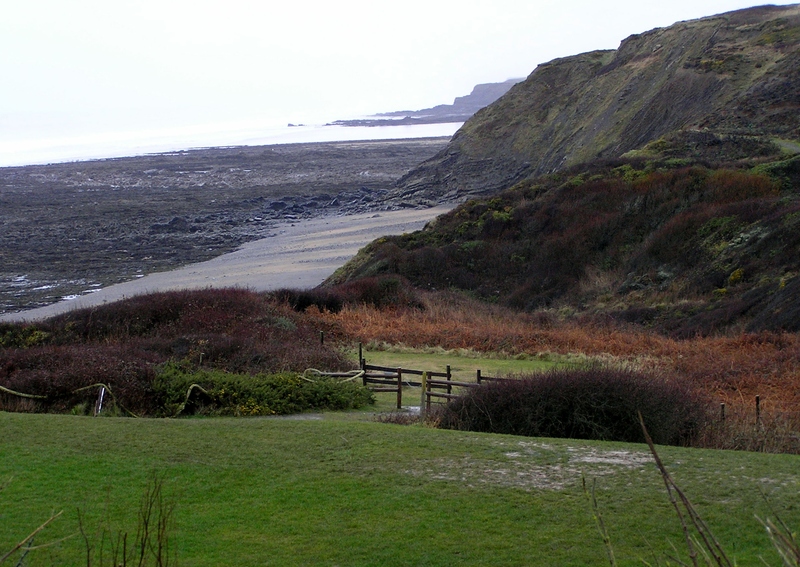 Here in Bude there is a march/ walk organised by the local Surf Club across the clifftop and beach led by a Cornish piper. The flag is so coloured because this saint is said to have discovered tin smelting. He lit a fire on his blackened hearthstone and as it heated the tin ore within it melted and rose to the top in the shape of a white cross. Three days of brilliant blue sunshine and not a cloud in the sky. We English obsess with the weather and it is often the topic of most conversation, but no wonder when it changes so quickly especially here on the coast. We are quite a small peninsula, with weather approaching from all directions. Certainly keeps it interesting. So a spell of settled weather really is a bonus. You really feel motivated, happy and ALIVE! I have finished my Commission piece. It is quite large at 90 x 60cm unframed. I am really pleased with it.. When my customer has seen it, I will post it in my New Paintings. The veg patch needs some attention and the spuds are in! May need some protection from frosts, but down here in the southwest, we can usually harvest mid May which is a good few weeks before the rest of the country. Family birthdays galore at the this end of the Month, and after taking a full roast dinner to Exeter for my son, yesterday was a lunch party for my lovely mother and another big family lunch at the farm tomorrow. So the spuds are planted, baked cheesecake cooling, out to dinner tonight with friends after an afternoon of rugby! Oh …. its a hard life.!!! It was one of the highest tides of the year today, and with huge surf pounding the beaches, we took off to Millook to see all the local boys surfing at low tide. The day and sky was heavily leaden with rainclouds coming offshore. The offshore wind was holding up great surf and we enjoyed an hour literally soaking in the damp atmosphere of a very grey stony millook beach, but on the drive back I took the opportunity to take a couple of pics. Spring hasn’t quite come to the hedgerows and cliff edges yet and the dried stumps and brush look even warmer in their burnt umbers and burnt siennas under the grey light. The tide is so low, that much more rock is exposed. 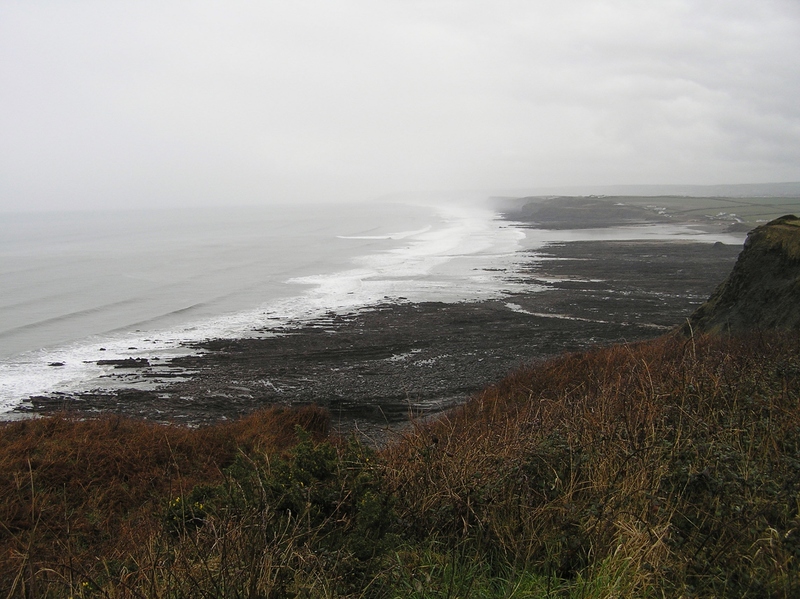 The lovely sands of Widemouth Bay are wet and grey and can be seen mid picture. Wanson Beach below has a shingle and sand beach with a moonscape of incredible rock. A painting is called for as much of the colour is lost in my photograph. I could paint at 7.00 am today. A beautiful start to the day as I welcome the arrival of Spring. The birds have been singing for a few weeks, but I like to see the natural light lengthening each day. I have a daylight bulb to paint by, but it is very very bright!! I am continuing working on a commission piece and a walk on the beach today gives me new inspiration as the cerulean and prussian blues are coming back into the sea colours. Welcome relief from the greys and greens of late: beautiful in themselves, but a higher sun gives more depth of colour and warmth in the blues. I will post an image file of the painting as soon as I consider it finished. Please let me know what you think of it.